Want to hear what 5Hz sounds like? A new woofer technology unlike any other and a new product category for home audio. This is the first home audio woofer delivering true response to DC. The Thigpen rotary woofer is the worlds first true infrasonic home audio or home theater woofer. Conventional subwoofers roll off rapidly below 20Hz. With no cone the rotary woofer achieves high efficiency at very low frequencies. Maximum acoustic output >110dB between 1 and 30Hz. A motor controller and electric motor rotate a set of blades at a constant speed. The rotary woofer pitch mechanism uses a conventional voice coil and magnet assembly. This is connected to your amplifier to pitch blades in proportion to the applied audio signal. As the blades pitch while rotating a pressure wave is generated, the degree of pitch controls the amplitude of the pressure wave. Air is allowed to transition through the blades. Thus oscillating the pitch of the blades creates sound while they are rotating . 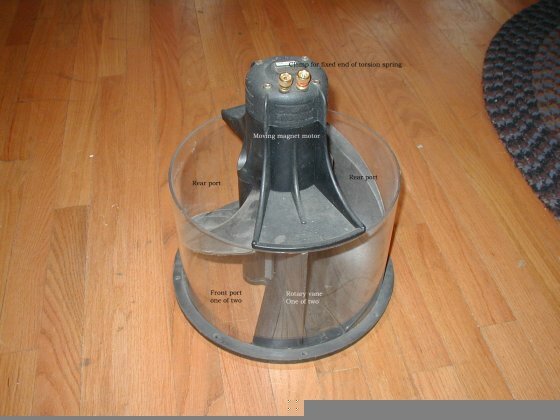 Thigpen rotary woofer (patent pending) and the conceptual jump occurs in understanding the impedance match with the air in this approach to sound reproduction versus the impedance mismatch with the air in a cone woofer. conventional speaker is simply a linear DC motor attached to a cone, why not use some sort of traditional rotary DC motor with some sort of rotary_to_linear translation mechanism? The upside of this is that you can potentially achieve excursions that would be impossible with linear motors. The downside is that the translation mechanisms tend to be difficult to design, noisy, and failure_prone. Still, such drivers do exist. The best known such system is the "ContraBass", produced by ServoDrive, and designed by Thomas Danley. The ContraBass uses a conventional rotary motor along with a belt_drive motion translator to drive dual cones. view Capable of delivering 114 dB at 16 Hz, the ContraBass is used wherever truly awesome amounts of low bass are required. Some of these include Disney World, Earthquake and Kong at Universal Studios, The Mirage Volcano (Las Vegas), Buccaneer Bay at Treasure Island (Las Vegas), and the Mt. St. Helens Visitor Center. The only rotary driver currently available (not any more! 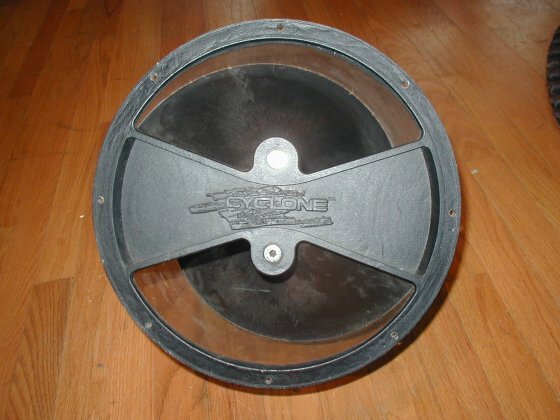 - se above) for DIY is the "Cyclone", another Danley design, produced by Phoenix Gold. The Cyclone is quite different from the ContraBass, looking like a ducted fan. The Cyclone is based on a revolutionary new technology that uses the rotational force of an unconventional moving_magnet system to drive a radiator directly. This new system converts low frequency signals into acoustical output without the physical limitations of conventional voice coils, cones, spiders, and surrounds. The result of this innovation is a subwoofer with ultra low distortion and 3 times the displacement of a conventional 12_inch subwoofer. 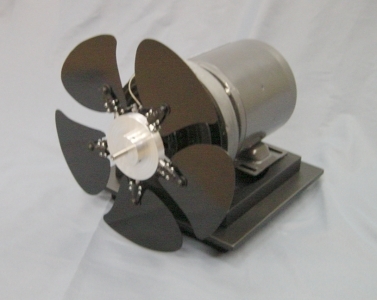 The Cyclone looks like a modified ducted fan _ a 12" outer cylindrical housing with what appear to be two simple fan blades attached to a central shaft, but with the addition of a pair of vanes. The motor uses a moving neodymium magnet within the rotor, with the VC anchored to the stator. This gives it excellent power handling (300 W, continuous). Like any other driver (even the Contra's), the Cyclone also produces a back wave and so the same enclosure decisions have to made when designing with it as with a more conventional driver. This is a little difficult because normal Thiele_Small parameters are largely meaningless for a driver of this type. (It is worth noting that Fs is quoted _ at 11 Hz!) As guidance, Phoenix Gold recommends its use in a 3 cu.ft. sealed or 3.5 cu.ft ported enclosure. Due to the extreme excursions possible with this design (125 cubic inches/2 liters displaced), to use it in a passive radiator (PR) design, you'll probably need two 15" PR's. However, according to Danley, the real key to using this driver well (he has them installed in his own listening room) is to provide sufficient air volume. Continuing the comparison of a Cyclone to a fan, one thing every engineer knows about fans vs. pumps (conventional drivers act as pumps) is that fans can move more air, but they can't generate much pressure. The vanes in the Cyclone prevent it from working exactly like a fan, but neither does it work exactly like a pump either. Still, like a fan, it works most efficiently when working into large volumes. Therefore, to effectively use a Cyclone, you don't want it working into a small contained volume. It would, however, make an excellent driver for a dipole woofer. Tom had a similar pair of these units loaded into a crawl space which had response down to 11_13Hz (I forget). The final Cyclone ended up having some reliabliity problems along with odd parameters for the car market, and ultimately died. Interestingly, I believe one of the Hi_Fi rags had noted a Cyclone in a sealed box to be what he thought was a reference subwoofer and one of the top innovations on the market... and this was a while after the product was out. Rotary Vanes Line Source No picture! Tom built what he called "rotary" speakers, the rotation being the movement of the vanes (the saloon doors) on a hinge. The voice coil was mounted in the center between the two vanes; its movement in and out imparted the movement. Sounded pretty good to me, typical line source characteristics. Rudi Blondia questioned the distortion characteristics, but they sounded clean, could go loud, and were pretty full range, down to about 80 if I remember correctly. I don't know how high up they reached.